Try these easy Thai dessert recipes. Thai desserts are exotic and tropical, plus healthy and lower in fat and calories than most Western-style desserts. Many make use of fresh fruit, and most are also gluten-free. Enjoy! 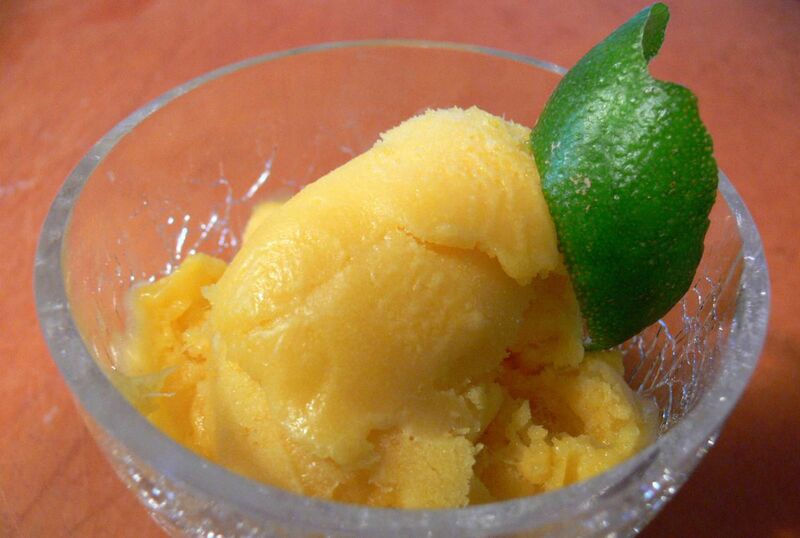 Try this fantastically easy recipe for mango sorbet. Quick and simple to make, and there's no stove involved. You'll need only a blender or food processor. This sorbet is creamier than most, halfway between sorbet and ice cream, but still light and full of mango flavor. Makes a beautiful dessert to serve company. Best of all, you can have it whipped up and in the freezer in just 20 minutes! A Thai version of the classic creme caramel dessert that is super-easy to make, melt-in-your mouth delicious, and healthier than traditional creme caramel! This recipe calls for coconut milk instead of cream (coconut milk contains good fats that actually lower your cholesterol), so if you're lactose-intolerant, this is a good dessert choice for you. It's also naturally gluten-free. This Thai recipe for mango pudding is very delicious - like the mango puddings you get at dim sum. Plus it's really easy to make - you'll have it whipped up and in the refrigerator in just 15 minutes. Great for company. These days, chocolate mousse can be found in practically every country around the world. But when Thai chefs take on this international favorite, you can bet it's going to be made extra wonderful with the addition of a few tropical touches. The following recipe hails from Bangkok and includes fresh ripe mangoes, a touch of cardamom, plus coconut milk (instead of dairy cream). The result is a rich-tasting mousse that is actually much lighter in calories than most Western-style mousses. This recipe for Coconut Sorbet turns out like a cross between sorbet and granita, but with all the coconut flavor and richness of ice cream. It tastes very much like some of the coconut ice cream you can buy from vendors on the streets of Thailand. Very easy to make (no stove involved), and this recipe does not require an ice cream maker. This Asian-style tapioca pudding recipe is so delicious and very easy to make (cooks in just 15 minutes!). In Thailand as well as throughout Southeast Asia, tapioca is a common dessert, but it is much different than our Western-style tapioca and so much better. This easy dessert only takes 5 minutes to make. But don't be deceived by its simplicity - the taste is so wonderfully sweet and exotic that I find it addictive! It's also a low-fat dessert that happens to be incredibly healthy. Unlike most fried banana recipes, this one doesn't involve a messy batter. It's surprisingly easy to make and tastes like restaurant-quality fried bananas. Enjoy them hot from the pan, or add ice cream on the side (vanilla or coconut) for a special Thai dessert that is to-die-for delicious. This easy dessert is so exotic and scrumptious tasting, you'll want to make it the next time you're entertaining guests. Tapioca is a natural root vegetable that looks like a grain when processed but is completely gluten-free. Although most tapioca puddings take hours to make, this one is ready in 30 minutes or less. The fresh mango is optional - you'll find this tapioca pudding delicious without it too. Just drizzle this over vanilla ice cream for an exotic treat that will wow your friends and family. A little sweet, a little spicy, this ice cream topping is a gourmet food lover's treat! This special dessert recipe is beautiful to serve, plus easy to make and healthy too! It starts with slices of fresh star fruit (instructions on how to buy and prepare star fruit are included). Star fruit is similar in texture and taste to apples, and while it can be eaten fresh, in this recipe the star fruit slices are lightly cooked and then given a tropical-tasting mango-orange sauce. If you're planning a cookout or bbq, this simple Thai dessert makes for a sweet ending to your party. Prepare the pineapple spears ahead of time, then just grill them up and serve. Wonderfully tropical tasting, plus healthy too! This beautiful Thai fruit salad recipe is a taste of paradise. Tropical fruit - or a mixture of tropical and local fruit - is tossed together in a sweet coconut-lime fruit salad dressing that enhances but never overwhelms the luscious taste of the fruit. Makes a healthy dessert that is especially nice to serve with a little whipped cream on a warm summer evening.